Photo: Adam Orris House, ca. 1887, 318 West Main Street, Mechanicsburg PA. Listed on the National Register of Historic Places in 1987. Photographed by User:Vamanos2000 (own work), 2013, [cc-by-3.0 (creativecommons.org/licenses/by/3.0)], via Wikimedia Commons, accessed March, 2015. 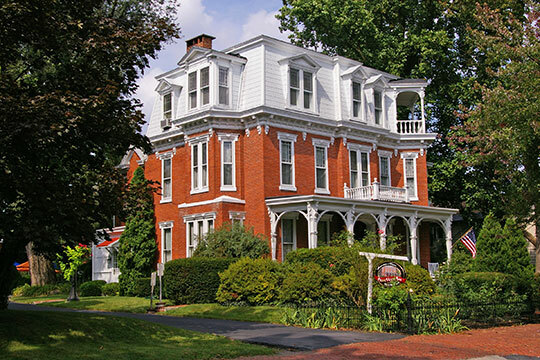 Mechanicsburg was founded in the early nineteenth century by men who settled in the area and serviced the wagons that traveled west through the Great Valley. Because of its location, at the junction of two major east-west Cumberland County roads and because the Cumberland Valley Railroad was extended to Mechanicsburg in 1837, the borough became an important commercial center in the county by the middle of the nineteenth century. In the late eighteenth century, settlement was begun directly to the west of Mechanicsburg at Trindle Springs. The availability of water and the fine grazing land made the site an attractive stopping point for drovers on their way to eastern cattle markets. In the early 1800's, westward migration increased along the new roads from the crossings of the Susquehanna River at Harris' Ferry (Harrisburg) and Simpson's Ferry. The influx of travelers created a demand for artisans and mechanics to repair and build wagons. The area was alternately called Pinchgut, Drytown, Stoufferstown and Mechanicsburg. The contribution of the mechanics was recognized in 1828 when the borough was incorporated as Mechanicsburg. Henry Stouffer was one of several landowners in the borough who tried to subdivide and develop their property in the early decades of the nineteenth century. He laid out lots in the central part of the borough, the intersection of Main and Market Streets in the 1820's. By standardizing lot sizes, 200 feet in depth by 50 feet in width (later subdivided to 25 feet), and by setting geographic boundaries, Stouffer Alley to Strawberry Alley, Stouffer set the guidelines for future development of the downtown section. By mid-century, Mechanicsburg had become a commercial community as well as a settlement of mechanics. Located midway between Harrisburg and Carlisle in eastern Cumberland County, Mechanicsburg not only served the on-road travelers who had historically utilized its facilities but also the growing number of commercial transients who were brought by the Cumberland Valley Railroad. The smaller, neighboring communities and rural areas also relied on the borough to provide shopping services. The 1850's was a period of tremendous growth in the borough. The population more than doubled and many business firms were established during that decade. Grocery, hardware, dry goods, drug stores, specialty shops and the first local bank were joined by newly established cultural, religious and public institutions. Lott, Susan G., Mechanicsburg Landmarks and Preservation Committee, Mechanicsburg Commercial Historic District, nomination document, 1983, National Park Service, National Register of Historic Places, Washington, D.C.